Mehedi, Henna (lawsonia inermi, family: lythraceae) is an evergreen bushy shrub or small tree with profuse branches, attaining a height of 2-8 m. The historical plant is native to differnt parts of Asia, Africa and Australasia. Common names: Henna, Hina, Mignonette tree, Egyptian privet. It is used in jaundice, leucorrhoea, shoulder pain, burning sensation in body, dandruff and insomnia. Leaves are elliptical, lanceolate, acuminate at the top and are sub-sessiled; 3-5 cm long and about 1 cm wide. Flowers are white, small, borne on terminal inflorescence. Petals 6. Flowers bloom from late summer to autumn. It is a very common homestead plant in Bangladesh. Fruits are small, granular, deep purple or black-colored when ripe. Seeds are numerous, smooth, pyramidal. Due to its great demand in market, it is produced commercially in Bangladesh. Debdaru (polyalthia longifolia, family: annonaceae) is an evergreen tree with straight trunk, horizontal branches, smooth and dark bark. It can get a height up to 90 m.
Common names: Debdaru, Indian fir tree. The beautiful tree is native to Indian subcontinent. Leaves are glossy green, about 5-20 cm long, lanceolate, with wavy edges. The tree is covered with inconspicuous, yellowish green and closely compacted flowers in the spring. It blooms in April. Immature fruits are green and when ripe they are deep purple or black. The three stages of the fruits. Wood is aromatic and used to cure burning, piles, urinary problem. Oil extracted from seeds is used in leprosy and other skin diseases. Its seeds and bark are used in fever. It can reduce noise pollution and can increase the beauty of a road. For this it is commonly planted in Bangladesh. Its timber is light yellow and used to make plywood, match box and packing box. It can stay alive up to 600 years in its natural habitats. Mahogany (swietenia mahagoni, family: meliaceae) is a medium-sized semi-deciduous treeattaining a height of 30-35 m. It has short but strong base, large canopy, many heavy branches and dense shade. It is native to United States and the Caribbean islands. It is grown as an ornamental tree in tropical regions of the world. Its wood is the first choice for making high-quality furniture throughout the world. The bark is furrowed and dark gray in color. 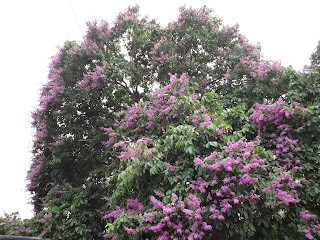 In Bangladesh, it is planted as ornamental tree beside roads, in parks and is planted by name of social forestry. Common names: Mahagni, Mahogany, West Indian mahogany. The leaves are compound, 60 cm long,leaflets4-10 pairs, each lance-shaped leaflet 20 cm long and 5 cm wide; terminal leafletless. Young leaves are blood red, quickly becoming a bright, light green and darkening as they mature. The flowers are very fragrant, greenish-yellow, 6-8 mm across, borne on axillary panicles. Flowers are unisexual and the tree is monoecious. Mahua or madhuca (madhuca longifolia, family: sapotaceae) is a medium sized to large deciduous tree with spreading and round crown. The plant is native to Indian subcontinent including Bangladesh. Mahua is a slow growing species. It can attain a height of up to 20 m. The trunk is small. Bark is almost smooth, gray or brown with cracks on it. Common names : Mahua, Madhuca, Mahwa, Butter tree. Youngleaves are bronze-colored, mature ones are dark green. Leaves become 10-15 cm long, elliptical-oblong, tip pointed. The flowers are used to make an alcoholic drink in Bangladesh and India. Different parts of the tree, especially the bark is used for medicine in its native range. Madhuca longifolia is regarded a boon to the indigenous people. Flowers are fleshy, borne at the tip of the twigs in clusters, creamy in color. Sepals 4, petals 8-9. The fragrant flowers bloom in the spring in Bangladesh. Nunia or Common purslane (portulaca oleracea, family: portulacaceae) is an annual herb with soft branches, attaining a height of 25-40 cm. Its stem is purplish, smooth. The succulent is found in different parts of North Africa, Middle East, South and Southeast Asia to Australasia. Common names: Common purslane, Pigweed, Little hogweed, Redroot, Moss rose. Alternate leaves are green, thick, small, oval, narrow at the petiole. Flowering occurs mainly in the summer and rainy season. Yellow flower blooms early in the morning; petals 4-5. Flowers are up to 6 mm wide. It grows as weed in fallow land, roadside and the margin of the crop field in Bangladesh. Seeds are formed in a tiny pod, which opens when the seeds are mature. Propagation is caused by seeds. It is emollient and stomachic. Leaves are eaten as vegetables.